Goalkeeper Trevor Carson’s diagnosis of deep vein thrombosis in an arm shocked everyone associated with Motherwell FC. Northern Ireland international Carson (30) missed Saturday’s 3-0 home win over Aberdeen in which his replacement, summer signing Mark Gillespie, acquitted himself exceptionally well and he’ll be required for many weeks as Carson recovers from treatment for the blood clot. Ex-Wallsall ace Gillespie (26) said: “It’s been a long six months, probably a year, for me personally. “I’ve played a lot of football when I was younger so it’s been difficult to sit and watch. “Obviously I’ve just tried to stay calm and wait for my chance. “It came against Aberdeen in difficult circumstances. “First of all my thoughts are with Trevor and his family. “Something like that was difficult for everyone at the club to take. “That win’s for him. All the boys hope he makes a quick recovery. “We train together every day and we push together. “I trained with him earlier in the week and he was complaining about something in his arm. Obviously he had no idea it was going to be like that. “So it’s difficult to get in that way but obviously football goes on. “I had a day to prep myself but I’ve had a lot of games in England so I was confident that I’d come in and do a job. I just tried to stay focused and I managed to do that. 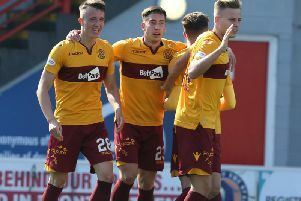 Gillespie said that the Motherwell players’ stirring display against Aberdeen had been motivated by how abject they were in losing 7-1 to Rangers in their previous league game at Ibrox on November 11. “I think if you’re not fired up from a 7-1 defeat then you’ve got a problem,” he said. “We owed the manager and we owed the fans a response. “And it was emphatic. I thought that everybody from back to front put a shift in. Gillespie played down his fine display in the 3-0 rout against the Dons. “I’m delighted,” he said. “Obviously the lads (including Gael Bigirimana, pictured right) were different class, made my job easy at times. “Especially second half when we controlled the game. Credit to them. “In games like that it’s easy to look back and say it was one sided. “But in the first half they had their moments as well. “Obviously the way we got the goal probably helped because it was such a bizarre counter attack. “It came out the blue. It settled everybody down and we went on to play the football in the second half that we controlled the game.